It is impossible not to love shepherd's pie. This dish has become a staple in my home, but not the traditional kind with lamb filling, as you can see. 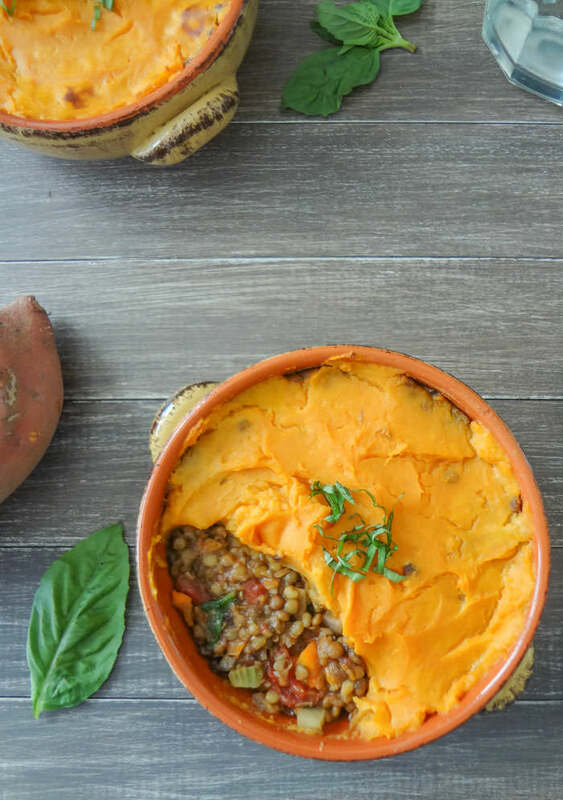 My version is stuffed with deliciously seasoned lentils and veggies, and topped with a gorgeous, vitamin-packed sweet potato mash. It's every bit as delicious as the original, but low in fat and high in protein, fibre, and nutrients. This shepherd's pie is the perfect simple, economical, hearty dinner that the whole family will love. Before anything else, peel and chop the sweet potatoes into small chunks. Get them in a pot of water and let them boil for at least 15-20 minutes, depending on size. Meanwhile, chop the carrots, onion, and celery (mirepoix) into small chunks. To make things super easy, I often buy a pre-cut mirepoix at Trader Joe's. Or you can use a food processor. Add this to a large skillet over medium heat with a tablespoon of water and allow them to soften. Once the veggies are softened, add the prepared lentils to the pan. You can use any kind of lentils you'd like… dried (cook them yourself), canned (drained), or pre-made lentils in a package (as long as the don't have any unnatural ingredients). Allow these to cook for several minutes with the mirepoix. Open the cans of diced tomatoes (but do not drain them) and add these along with a tablespoon of chopped (or dried) basil leaves, a handful of chopped spinach, and a splash of soy sauce. Let this filling simmer for 10-15 minutes for the flavors to mingle. When the sweet potatoes are soft all the way through, remove them from the heat and drain the water. Mash with a little salt and a splash of non-dairy milk until the consistency is perfect. 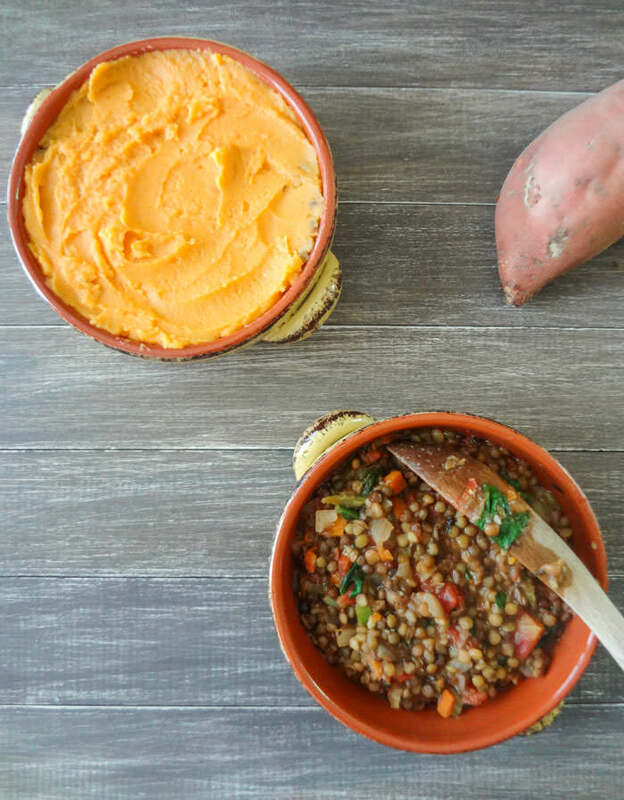 Add the lentil filling to a 9 x 13 pan and top with a layer of sweet potatoes. Or, like pictured, you can add to individual oven-safe bowls. Bake in the oven for about 20 minutes until the topping becomes slightly browned. Allow to cool before serving. This recipe yields about 6 servings and makes excellent leftovers the next evening for a 2-for-1 dinner.